With winter well upon us, the number of people we are likely to run into on our training runs is greatly reduced; however it is still a great time to brush up on our running etiquette. 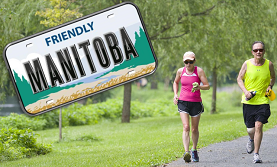 When we’re out on the path, be a Friendly Manitoban and follow these simple guidelines to be a considerate runner. Just before we get into etiquette, let’s talk safety. I hope I am preaching to the choir with this, but it’s always good to remember that it is primarily our responsibility to ensure we are safe when running: don’t count on drivers or cyclists to see you. Keep the volume on your earphones down (if you need to use them at all) or only run with one earbud in and look both ways (twice!) before you cross any intersection. If you have to run on the road, run towards traffic for maximum visibility and if you are running in the dim hours of the day, visibility and reflective clothing are your best friend. Lastly, we are blessed in the city with a lot of multi-use paths which is great… as long as we remember to stay in our lane. Cyclists are making a lot of quick decisions on the road – don’t make dodging you one of them. Share the path: Nobody likes a path hog. Be aware of others that are using the same space and stay to the right so that faster runners (or cyclists) can pass easily. If you are running the tangent, do a quick shoulder check to ensure you aren’t cutting someone off. And if you are running in a group, don’t run more than two across. People shouldn’t have to figure out a way to get around you if they are faster. Don’t stop suddenly. Please. : I have to say this is my biggest race day pet peeve, but the same rule applies to everyday runs. If you have to stop to stretch a cramp or tie a shoe, pull off the path so that if someone is behind you they won’t run into your back like an episode of Looney Tunes. Give a wave get a wave: I am a HUGE advocate of the runner’s wave; I even make my eight year old do it when he runs with me. A quick swipe of the hand at a passing runner, or even a smile or nod (if you are hurting and that’s all you can muster) is all it takes. Unlike many other sports, when it comes to running we are all in this together – one big community. Sometimes a smile or a nod at a new runner helps them feel included, or a wave at a runner who is dragging through some hill training says “hey buddy, I’ve been there”. We are one family, show some love. Alert people when you are passing them: If you are the fast one, put on a little extra gas and pass quickly. Give them a bit of notice with an “on your left” in case they forgot to follow one of our basic safety rules of keeping the volume low in their headphones. Don’t litter: Litter bugs give runners a bad name. If you have used gel packages, kleenex or whatnot, keep it in a pocket or waistband until you can find a trash can. 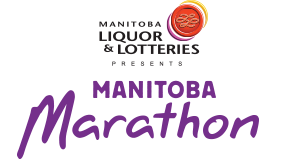 Let’s keep Manitoba gorgeous!